Here’s a kiss to the Keys saying “This is the life”. This is Jenna writing finally, after a while. I have been very busy lately due to online college work and my current internship at a Theater of the Sea in Islamorada, FL which has slowed me down a lot recently to the point where I no longer had anytime to blog about my experiences. So, now that my finals for the semester are out of the way, I can finally get to blog about how things have been going down here in the Florida Keys. I personally love my internship at Theater of the Sea. So, far, I have had the best five weeks of my life getting my foot in the animal training field through some hands-on experience with the dolphins, sea lions, and rays at the park. So far, I have done some water-work training sessions with the dolphins and a sea lion named Bella as well as a couple of feeding sessions here and there with the sting rays at stingray beach. In addition, I have been assisting a lot with getting music ready for the shows and picking out volunteers to meet the animals up-close in person. Some of these people have even asked me to picked them to meet the animals too like this one grandmother from France who came to the Keys with her young grandson because he wanted to see a dolphin. When she came up to me, I was so touched by her story how it was her grandson’s dream to meet a real dolphin that I had to pick him to meet one and so, after I fulfilled his wish, I picked him for a second time to toss rings to Wilbur the sea lion and believe me, he wowed the crowed by throwing the ring from a far distance. It felt so good granting some kid his life-long wish because this is the kind of stuff that most people may never get the chance to do and also, it was Christmas and I was taught for a long time that Christmas is not really about the presents you get under the Christmas tree, it’s more about caring for those who really want to be cared for. With a lot of delight, I am very happy to day that Tampa Bay’s Bay News 9 has confirmed that Winter the dolphin has finally been paired with Hope almost one year after Clearwater Marine Aquarium’s youngest bottlenose dolphin was first moved to the Winter Zone from the Dolphin Zone where she had been residing since the winter of 2011. The CMA staff is reporting that Winter and Hope have been getting along very well and the introduction has been a huge success. Congrats to Winter and Hope and a very successful introduction. Back to Life in the Keys…. Since my internship is a paid one, I have decided that I will be using all my current paychecks to pay to have my SCUBA lessons be done down here in Key Largo since I found out that it’s very expensive to get certified up north while it’s cheaper down here. Plus, I have always wanted to go scuba diving in Florida’s coral reefs and see the ship wrecks that are down there. This would mean I would have stay in the Keys long after my internship ends and that would also mean finding a job down here too so that I would be able to help pay for the condo my mother and I are renting at the Moon Bay condominiums in Key Largo. I am so glad that I’m spending the holidays in paradise because I don’t have to worry too much about the cold weather. Any way, I hope you all are having a great Christmas and a Happy New Year. Merry Christmas from the Florida Keys. Hope in her new home at (Drums rolling).................The Winter Zone. 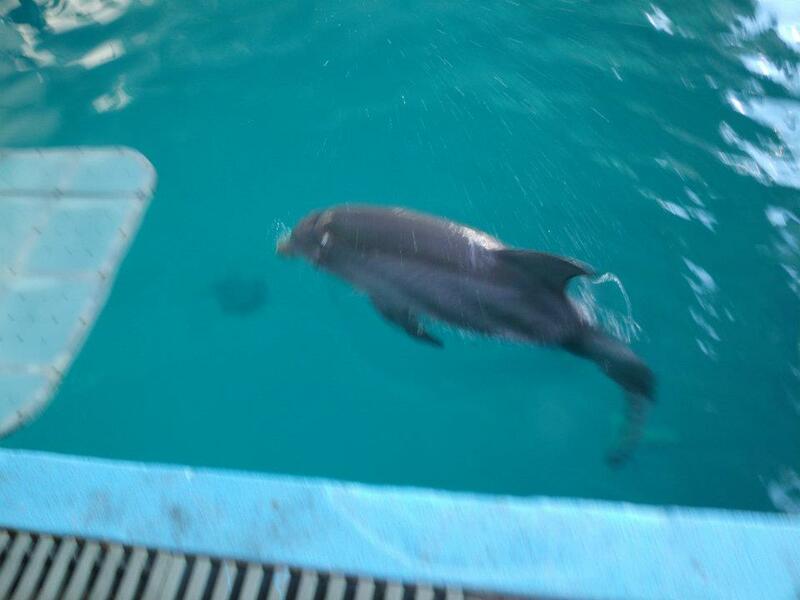 I am very happy to report that on January 4th (the day I visited Clearwater Marine Aquarium since the end of my first internship), Hope, a 14-month old bottlenose dolphin calf has been moved from the Dolphin Deck, to the Winter Zone. This move is just a major milestone for this dolphin because the plan is to introduce her to both Winter and Panama in the near future. However, Hope will likely be first paired with Panama who would serve as an adoptive mother to her like she has to Winter. If this goes well, then they will try to pair her with Winter who would serve as her adoptive sister (Winter tried to interact with Hope behind the gate walls just moments before her training session which left Winter swimming back to one of main gates). Just to keep you more updated, Hope has been weaned from her bottle and continues to learn new behaviors on a daily basis. On December 11th, 2010 (about five years and one day after Winter’s rescue), Hope, who was estimated to be two to three months old, was found attempting to nurse from the carcass of her dead mother in Indian River Lagoon, FL. Due to being parentless, Hope was transfered to Clearwater Marine Aquarium under orders of the US National Marine Services for rehabilitation purposes. She has suffered from trauma and at the time of her rescue, her condition was believed to be fragile. Not only was she found in the same region in Florida where Winter was found, she was also rescued by the same two organizations that found Winter too. During her first few weeks at CMA, Hope was given 24 hour care by both the staff and volunteers and she was fed every two hours. Since she’s a young calf, Hope is fed by bottle. The formula in the bottle is made with a combination of fish, powdered milk substitute, and water that is all blended together to created a “fish milkshake”. Today, Hope, who lives at the Dolphin Deck Exhibit, is almost one year old and weights in at 150 pounds (she’s is continuing to grow constantly!). Hope was declared “non-releasable” in early 2011 due to her young age at the time of rescue. This is because Hope was never taught to neither hunt or defend herself from her mother, who she would have stayed with for up to six years in the wild. Although people can teach a dolphin how to hunt, they can’t teach them how to identify which animals are predators, how to avoid boats, and use sonar to navigate through murky waters. So, instead, she will continue to reside at Clearwater Marine Aquarium as permanent resident. Hope has been fully trained to do various behaviors for medical, mental, and developmental purposes. She is also being taught how to swallow fish on her own. The ultimate goal is to introduce Hope to Winter and eventually pair them up as sisters once she has been weaned off the bottle completely. You can now like "The Winter Dolphin Chronicles on facebook. Here is some good news to all of you WDC fans out there. 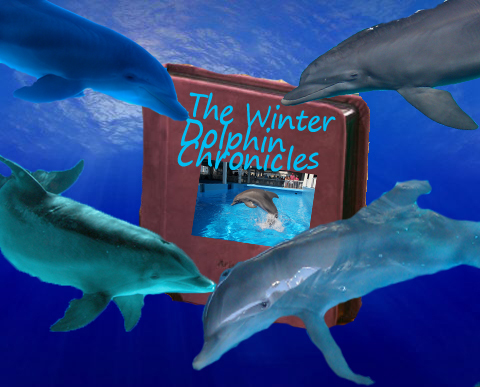 The Winter Dolphin Chronicles is now of facebook. The facebook page has links to blog archives, links on various marine life and CMA-related articles, photos from CMA, and of course, updates on the site itself. 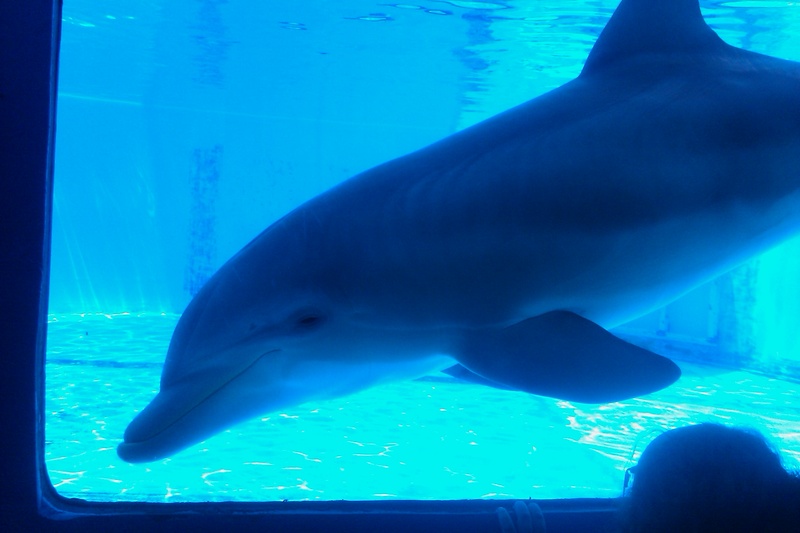 So come visit WDC at: http://www.facebook.com/pages/The-Winter-Dolphin-Chronicles-A-Blog-By-An-Aquarium-Intern/198874656839412 and hope to see you there. Hope sure loves to interact with you behind the glass when she's in a very playful mood. When ever I end up doing mobile props and I have to go down to the underwater viewing at Dolphin Deck to find people whom I can be able to share the prop with, our baby dolphin Hope, may sometimes come right up to me through the glass windows and check out what is that thing I have in my hands. It just makes me think that the seven-month old bottlenose dolphin is pretty curious about what goes on outside of her window. 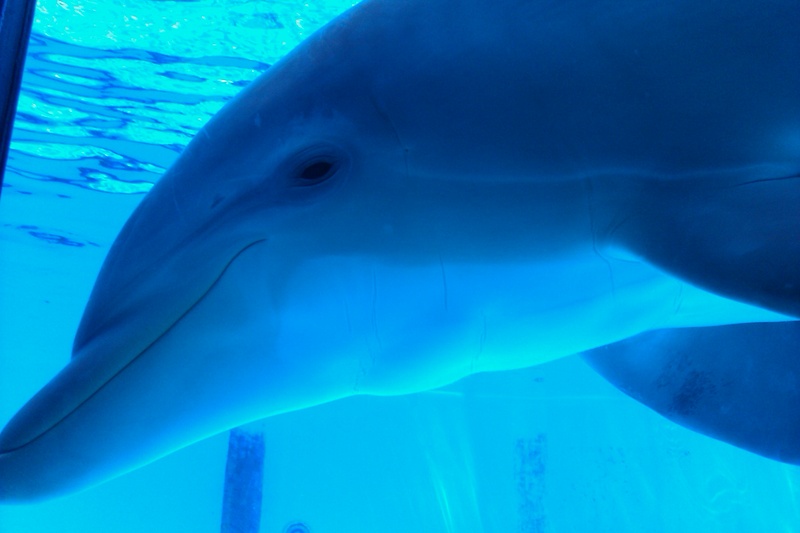 For example, I was presenting a dolphin skull to a group of people at the Dolphin Deck’s underwater viewing when all of the sudden, Hope came right up to us and would not leave that window unless, she was taking a breath of fresh air. I wondered if Hope was attracted to the dolphin skull because she was constantly just hanging there with us from the comfort of her window. Because I was so curious about Hope’s curiosity about the skull, I started to face it in front of the window while opening it’s jaw. Hope’s response was to take a breath of fresh air and just stick her face to the window. 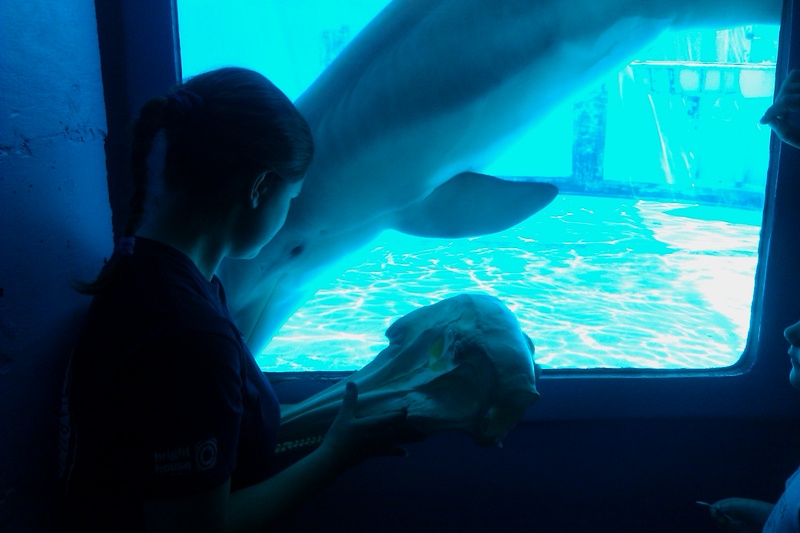 It was one of the cutest experiences I had at Clearwater Marine Aquarium during my internship. Hope sure loves that dolphin skull. One of the reasons why she'll interact with you. However, she will still interact with you if you have a few toys on you.